Retail $5.52 SAVE 30% ! I use this paint marker for touch ups. The ease of it is perfect for that. The tip is soft so it will not hand a lot of complete painting unless you buy more tips to replace the unraveled one.. be sure to keep them stored in a tip down position too! Not recommended for: vinyl, polyethylene, polypropylene plastics, or lexan. 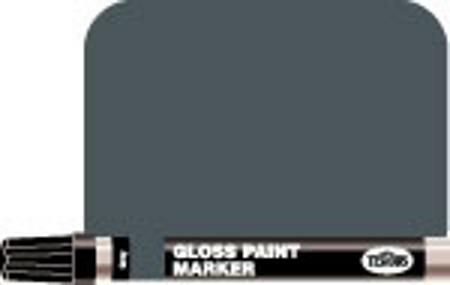 All-purpose marker contains no lead and has a tip designed for fine- line painting or painting larger areas. Marker is carded and packaged for clear visibility, with Blue color on front. Cap removes by twisting; shake marker for 30 seconds before using and depress tip to get steady, activated flow. Depress tip occassionally to maintain paint flow, and recap and shake periodically for better flow. Replace cap tightly when marker is not in use. If tip dries out, soak overnight in Thinner (TESR2148) or in Brush Cleaner (TESR3156). CAUTION: Flammable, keep from heat and flame, use in a well- ventilated area.